South Korean and Japanese companies are competing head to head in Chinese markets for flexible OLED deposition equipment and are having fierce competitions with each other as they are repeatedly having seesaw games in order to win contracts from Chinese companies. OLED investments will take place starting from this year until next year in China. Because outlook of early competitions is likely to determine winners and losers in global deposition equipment industries, South Korean companies are focusing all of its capabilities into such industries. According to industries on the 5th, South Korean and Japanese equipment manufacturers are having fierce competitions with each other in order to win contracts from GVO (GoVisionox), Everdisplay BOE, and CSOT that are planning to order 6th generation flexible OLED deposition equipment this year. Japan’s Canon Tokki was the first company this year to announce news of victory. It recently was placed at the top of evaluation results done by Canon Tokki for its 6th generation flexible OLED deposition equipment business. If there aren’t any variables during final evaluation process, it will be selected as the final bidder. Canon Tokki supplied entire organic deposition equipment to Samsung Display for tis 6th generation flexible OLED lines. Its experience in successfully having stable mass-productions is its strength. It also supplied entire organic deposition equipment to BOE. GVO ordered 6th generation deposition equipment through its 6th generation OLED production corporate. South Korean company called SFA supplied two of its deposition equipment for 5.5th generation line to GVO last October and had had high expectations in winning order for 6th generation equipment as well. However it had had difficulties in winning orders as it only had equipment that can divide 6th generation panels into four and was not able to implement half-cut method that divides 6th generation panels into two. It is likely that Everdisplay, which recently decided to invest into 6th generation flexible OLEDs, will be the biggest battle place during second half of this year. It is going to start mass-producing 30,000 6th generation flexible OLEDs per month in second quarter of 2019. South Korea’s SFA and Japan’s Canon Tokki and ULVAC are competing against one another in order to win contracts from Everdisplay. It is likely that competitions between SFA and ULVAC, which lost to Canon Tokki in businesses for GVO, are going to be fiercer than competitions against Canon Tokki. It is expected that they will start making first stage of investments during second half of this year and second stage of investments during first half of next year. BOE’s B11 line, which is going to start ordering equipment at the end of this year, is also going to be a place of battles. There is a low chance that other deposition equipment manufacturers will be able to win contracts from BOE as BOE had gone through three stages of investments on B7 and used deposition equipment only from Canon Tokki. 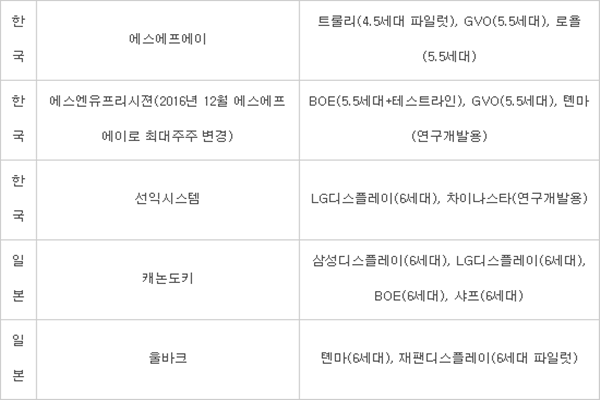 However because other panel manufacturers besides BOE are requesting deposition equipment from Canon Tokki, Canon Tokki’s competitors can look for gaps to win contracts from these manufacturers. Deposition equipment manufacturers are also paying careful attention towards CSOT, which will start ordering equipment for its first 6th generation flexible OLED facilities during second half of this year. There is a chance that it will use Canon Tokki’s deposition equipment that has been verified. However there is a chance that it will look to work with other businesses as South Korea’s SUNIC System has experiences of supplying deposition equipment to CSOT for its R&D lines and 6th generation half-method equipment to LG Display.